He’s one of the most controversial tennis players in Australia and now Nick Kyrgios has come under fire from competitor Rafael Nadal following a match at the Mexican Open on Thursday. The match was a triumphant win for 23-year-old Kyrgios, who at one point during the match admitted he was sick but didn’t want to forfeit because of the media reaction. In the end, it was a 3-6 7-6(2) 7-6(6) win for Kyrgios, but the match wasn’t without controversies. The Aussie player told the crowd to shut up at one point, resulting in a code violation. His use of a quick underarm serve while Nadal was standing behind the baseline also drew criticism – despite the player not breaking any rules. Still, Kyrgios was booed by the audience following the match and received a brief and frosty handshake from Nadal from over the net. Nadal firstly praised his opponent in a post-match press conference in Spanish following his loss, but quickly criticised the world No. 64 player. 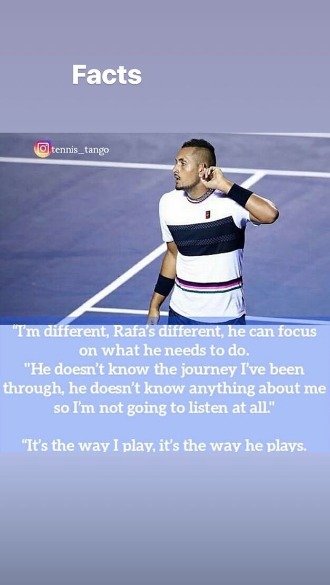 Kyrgios wasted no time responding to Nadal in his own press conference. He later posted a video on Instagram of his match point and frosty handshake with Nadal. Some have speculated on social media that Kyrgios’s comment about smelling the blood was in reference to the Operation Puerto doping scandal that rocked Spanish sport 13 years ago, with investigations still ongoing. A number of Spanish cyclists were found to have been blood doping — where oxygenated blood is injected to give the recipient more energy — while footballers and tennis players were also connected to the scandal. There is no suggestion that Nadal was involved in the scandal. Still, audiences are divided when it comes to Kyrgios’s attitude. What are your thoughts on this? Are you a fan of Nick Kyrgios?